The Mandarin Museum & Historical Society was founded in 1989 by a group of citizens concerned with the loss of historical structures in Mandarin and interested in preserving and celebrating the rich heritage and history of the area. The first major project conducted by the organization was restoring the Historic Mandarin Post Office and Walter Jones General Store, which served as the heart of the community until it closed in 1964. In 1998, the Mandarin Store and Post Office was reopened to the public as a museum exhibiting artifacts that illustrated the role of the general store and post office as a social and commercial hub for the Mandarin community. In 2001, the building was listed on the National Register of Historical Places and earned a designation as a local landmark by the Jacksonville Historic Preservation Commission. An even greater opportunity for the Mandarin Museum & Historical Society to preserve the local heritage began in 1993, when the City of Jacksonville was offered the Walter Jones homestead for purchase. The property was originally occupied by the Webb family through 1904, when it was sold to the Jones family. Walter Jones, and later his daughter Agnes, served as proprietor and postmaster at the Mandarin Store and Post Office. In 2000, the city opened the 10-acre Walter Jones Historical Park, the first historical park in Jacksonville’s extensive park system. At that time, the riverfront park included a farmhouse, barn, and outbuildings, as well as an interpretive reconstruction of the Mandarin boardwalk that was a fixture of community in the late 19th century. The city approached the Mandarin Museum & Historical Society to provide programs that would incorporate the historic structures and “breathe life into the park.” It was later proposed that a new community museum be built in the park to house the museum’s collection. A cooperative partnership was formalized between the city and the Mandarin Museum & Historical Society. Under the agreement, the city would own and maintain the buildings and grounds within the park, while the Mandarin Museum & Historical Society would be licensed to operate in the park and to produce public programs. In 2004, the Mandarin Museum was opened with two galleries, an administration office, and a small archives room. 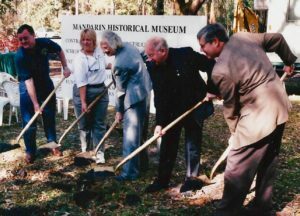 Since the opening of the museum, the Mandarin Museum & Historical Society has enhanced the original exhibits so visitors can explore some of the people and events that shaped the Mandarin community from the area’s early history as a Timucua village site to the mid 20th century. Featured exhibits include the wreck of the Civil War steamboat Maple Leaf and renowned writer Harriet Beecher Stowe’s life in Mandarin. The museum also includes a museum shop, the Mandarin archives, and an art gallery that exhibits the works of famed local artists such as Memphis Wood and Charlie Brown. The Mandarin Museum & Historical Society also acquired other historic structures to add to the park. These include an early 20th-century saw mill and a late 19th-century log cabin belonging to the Losco family, which was part of the largest wine operation in Northeast Florida. The organization also created a historical kitchen garden based on the writings of Stowe and started a citrus grove that demonstrate the types of fruit that were grown when Mandarin was a major citrus producer. The latest acquisition was the 1898 St. Joseph’s Mission Schoolhouse for African-American Children, which opened in 2016. We are proud and grateful to be one of 27 non-profits to receive “City of Jacksonville funds that are administered by the Cultural Council of Greater Jacksonville through the Cultural Service Grant Program (CSGP), a competitive grant process governed by City ordinance (Chapter 118, Part 6).” In FY2018-19 we will receive $6182 from this grant to help support our mission of cultural programming. To learn more about the the Cultural Council and this program, click here.